PhytoChemia's Blog: Quality Control 101. III. Is Carbon 14 Testing a Reliable Method to Detect Adulteration? Quality Control 101. III. Is Carbon 14 Testing a Reliable Method to Detect Adulteration? Our recent clarification about our usage of "synthetic" and "natural" to describe molecules shed light on one particular way to define synthetics, based on the origin of the building blocks (petroleum or fresh organic molecules from natural sources). We wanted to discuss this aspect further, since it is deeply tied to a trendy and highly specialized analytical technique, carbon 14 analyzis. Carbon (which is mainly constituted of Carbon-12, the most stable and abundant isotope) is the building block of life on Earth. Most of the carbon found in living creatures originate from plants, which fix it from atmospheric carbon dioxide through photosynthesis. This carbon is turned into sugars, then processed further into an impressive variety of molecules within plants themselves, and by whatever feeds on the plants or decaying matter of plant origin (animals, fungi, bacteria, and so on). Thus, "fresh" carbon is picked by plants from the atmosphere. And that atmosphere is a quite exposed place: among others, it is significantly irradiated from outer space, where one finds a plethora of radiations. These include some cosmic rays that create a cascade of reactions producing neutrons. These will collide with Nitrogen-14 atoms, turning them into Carbon-14. 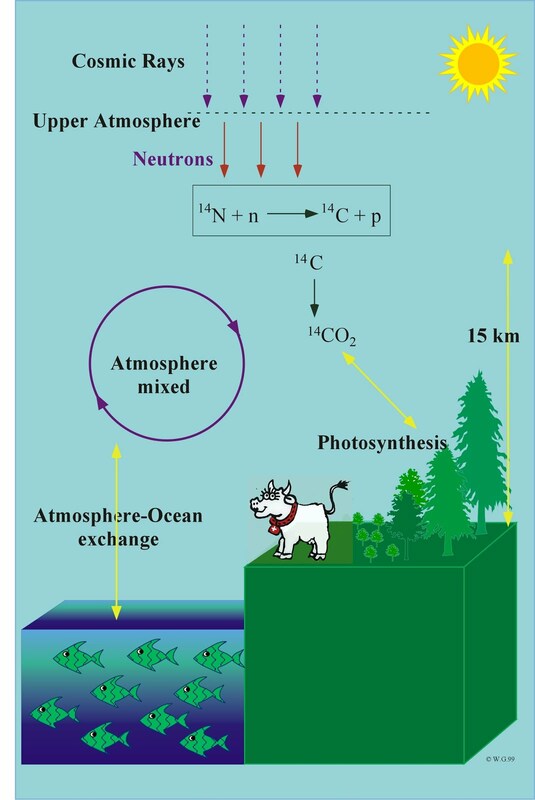 Since the Earth's atmosphere exposure to radiations is quite constant, the proportion of Nitrogen-14 that turns to Carbon-14 in the atmosphere is very steady. Variation do occur though: among others, the nuclear testings of the 50's increased the ratio by a lot, and more recently the generalized burning of fossil fuel diluted the Carbon-14 with a massive amount of Carbon-12. Still, the amount of Carbon-14 of the biosphere as a whole is either constant or known for various timeframes. As molecules comprise a great number of carbons, and that living beings are made of astounding numbers of molecules, statistical rules apply and any given natural molecule will contain roughly the same proportion of Carbon-14 atoms amongst the dominant Carbon-12. So analyzing a bit of your skin, an herbal tea or a natural essential oil will yield the same result - a ratio of Carbon-14 closely matching that known to be found in any living being of the same era. Carbon 14 is a radioactive isotope of carbon, meaning that it will slowly decay over time. It will emit β radiation and transform into a stable Nitrogen-14 atom. The Carbon-14 has a half-life of about 5700 years, which mean that almost all of the Carbon-14 will be gone after about 10 000 years, provided there is no contact of the whole carbon reserve with any more radiation. Petroleum, forming from dead beings decaying under thick layers of soil over the course of hundreds of thousands years, is well shielded from these. As such, it contains no Carbon-14. So, in analyzing for example benzene, a subproduct of petroleum distillation, for its Carbon-14 content, one can quickly conclude its fossil fuel origin. Carbon-14 is detected by highly specialized mass spectrometric equipment, way beyond GC-MS, and much more sensitive, since the isotope is only found in minute quantities overall. 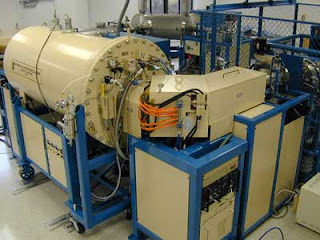 The equipement called AMS or Accelerated Mass Spectrometry is a cross between a mass spectrometer (MS) and a particle accelerator (figure 2). These instrument are currently room sized and are generally owned by universities or public research centers due to their price. The question is, is that a reliable method to detect adulteration by synthetics in essential oils? The answer will depend on the definition you are using to define synthetics. Using the petro-centered definition of synthetic material presented in our last post, Carbon-14 is great: it can tell with excellent certitude whether a sample contains petro-derived carbon or not. And when it comes from petroleum, obviously, something was added to the essential oil, which should only be derived from the plant's photosynthetic carbon. But that does not make the method reliable at all for bulk detection! That is because using other, broader definitions of synthetic molecules, one can perfectly imagine compounds that are purely synthetic (not even found in natural beings at all) but that would pass with no trouble the Carbon-14 testing, because all of their building blocks would come from nature. Take a look back at the linalool synthetized from beta-pinene: all of the carbon atoms in the final molecule (10 carbons) were present in the starting material (also 10 carbons), and the latter is obtained from conifers. A regular amount of Carbon-14 would be found, and the costly Carbon-14 analyzis would not reveal any adulteration, whereas gas chromatography would probably cast light on the problem. One could also think of isobornyl cyclohexanol, which we spoke of earlier on these pages. The molecule is obtained from camphene and guaiacol. The former is derived from alpha-pinene, and thus perfectly natural. The latter can be obtained from petroleum derivatives, but also from natural sources. If natural-sourced guaiacol is used, isobornyl cyclohexanol (a purely synthetic molecule with no natural equivalent known) will go entirely unnoticed on Carbon-14 testing. In conclusion, a Carbon-14 results showing a deviation from normality will always be sign of adulteration or contamination. But results not showing this deviation will not necessarly mean that it is not adulterated. All in all, Carbon-14 is great to confirm suspicions of adulteration with petroleum-derived material. However, it certainly is not a frontline adulteration detection method, since it can completely omit obvious adulterations that can be detected by chromatographic techniques.